When the police chief is arrested the investigating team are jubilant. There had been opportunities in the past to pin him down but until now he had always slipped through the net. Now they have proved grounds for his arrest. But will the charges stick at the trial itself? It is down to the investigative team to build a watertight case and to prove that this clever and well-respected detective was also a Nazi war-criminal. In another writing life journalist David Thomas publishes successful thrillers under the pen name Tom Cain. OSTLAND is Thomas's second book under his own name, the first being BLOOD RELATIVE. 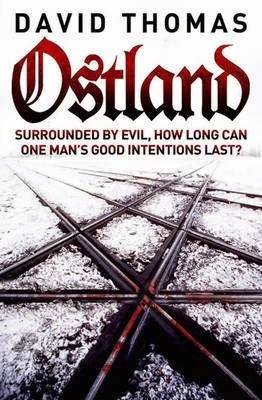 Based on historical facts and characters, much of OSTLAND is written as the first person narrative of police inspector Georg Heuser and tells his story from his first criminal investigation in 1941 Berlin to his later activities in the killing fields of Minsk (in present day Belarus) before the area fell to the Soviets in 1944. It is the story of Heuser's transformation from good civil detective to a Nazi war-criminal. “Ostland” was the name given to the Baltic States by the Nazis during the years of their occupation. It was an area which became the horrific setting for Reinhard Heydrich's “Final Solution” with many German and Austrian Jews, for instance, being transported to Minsk for “processing”. Heuser's story is interspersed with that of the German post-war investigative team, and Heuser's subsequent 1960s trial for presiding over and participating in the mass execution of Russian, German and Austrian Jews in the Minsk ghetto and its surrounding villages. In this way not only does Thomas try to get to grips with Heuser's transformation from good detective to mass-executioner, but with the consequences of the fact that he returned to Germany and eventually to a respected career with the West German police. Aside from the 1960s investigation, I found Heuser's story fell into two parts: the police hunt for the man behind the S-Bahn murders in which Heuser plays a part; and the calculated horrors of the extermination “actions” of Ostland – in which Heuser also plays a part. I found the beginning of the book slightly clunky, perhaps brought about by too blunt an injection of historical facts and by an uncertain feel to Heuser's “voice”. But the “S-Bahn Killer” episode becomes truly gripping as a crime story in its own right. And in the later part of the book – where Heuser is transformed by his Ostland experiences – the writing seems more integrated and the voice of Heuser more sure and believable. This is a harrowing book, laying out as it does the brutal precision of The Holocaust. How successful Thomas has been in depicting Heuser's inner world and his transformation I am unsure. But it was a huge undertaking and the book remains a revelation of the breadth of the plan to liquidate a people, the unforgiving brutalities of war and racial hatred and their effect upon victim and perpetrator alike – and the ambiguous nature of “the good servant”. That was a great review! The subject of the book sounds very interesting, and from your review it sounds like a good one! A friend recommend the book " No One Can Know" by author Adrienne LaCava. http://adriennelacava.com/ I absolutely loved this book! This is a political fiction thriller set in the backdrop of the 1960s during the JFK assassination, which begins as a CIA agent as a witness who must now go into hiding at the ranch. The family also takes in their pre-teen niece, whom they have never met. Everyone is put to the test as a marksman is sent to the ranch to hunt down the agent. It is an ambiguous tale, and assumes that we will never know! I can see myself reading this over and over again! Ostland has definitely captured my attention. Thanks for your review on this one! I appreciate the recommend, Robyn. Another fascinating story I will have to check out. Ostland is a fascinating yet very disturbing novel. Almost all activity in my life ceased until I finished it. Thomas' style and prose added real substance to an ugly subject. Your review is spot on.